Instagram has become the go-to social media platform for the younger generation. Users of the platform flock to it each and every day, so they consume their content in a curated bite-sized visual format and follow the latest online trends. What has made Instagram so popular is the ease of connecting with users, accounts and finding the content you would like to see. The explore page has been the gateway for many users looking to find new accounts. Until now, Instagram has taken a page out of SnapChat's book and created a feature that makes it easier for users to connect with people they meet in-person. 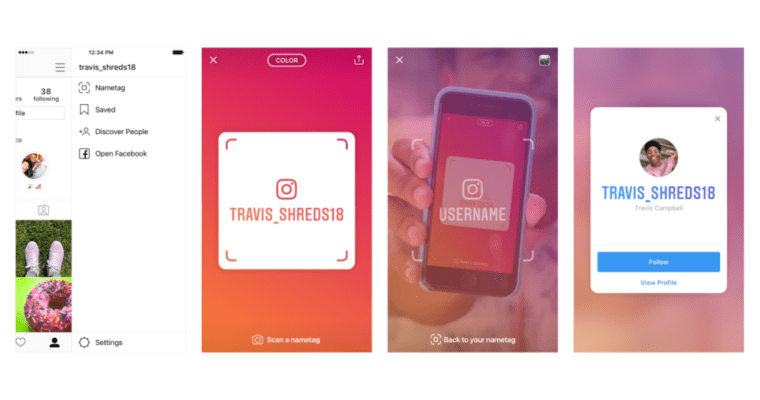 The new ‘Nametag’ feature is a scannable identification card that lets people find and follow each other on Instagram. Users can display their Nametag by opening the Instagram app and tapping the three-dash menu button in the top right corner. Select ‘Nametag’ to bring up the name tag on the screen. Now it’s ready for scanning. For those who aren’t satisfied with the default look and feel, no need to worry, the Nametag can be customised with a range of colours, emojis, selfies, and stickers. On the same screen, there is also an option to scan another person’s Nametag. Alternatively, users can just open the Instagram camera to scan a Nametag by hovering over it and long-pressing on the screen. If you're keen on getting the message out there in a broader digital spectrum, there is a share button that can be used to share it through text messages or other platforms like Facebook and WhatsApp. Instagram has stated that nametags will be available globally on both Android and iOS starting today. So what are you waiting for? Open up your Instagram and start collecting those followers. Instagram is trying to engrain its presence in modern pop culture and having physical reminders, and a quirky new way to engage with the platform is what builds a strong brand association and encourages adoption and retention. As social media has become the new form of mass media, it will start to transcend its digital boundaries into the physical in order to reach more users, stay top of mind and increase return rates which ultimately means more eyes to advertise to and more money in the bank. Unlike Facebook where engagement/likes are the currency of choice on Instagram's metric of choice is followers. This is what matters most to brands and influencers and how we gauge success on the platform. Having a new way to recruit followers opens up a unique opportunity to be creative and use its innovative approaches to capture a new audience. It could be on your latest flyer, menu, your clothing label, as an add in the newspaper or on your website. The nametags versatility combined with the proliferation of Instagram makes it an easy way to reach and acquire new followers online.